TCF online banking harnesses all the benefits of your local bank branch and delivers them to your desktop, laptop, or mobile device. With the TCF Bank online login, you can move money with fund transfers or online bill pay, and track your cash with real-time account balances and accessible online statements. These features and much more mean the TCF login portal is your window to a better financial future. This step-by-step guide has all the information and quick links you need to complete the TCF Bank online banking login. Navigate to the TCF Bank website, www.tcfbank.com. Click the red lock icon on the top of the landing page, to the right. The TCF online banking login menu should pop out. Alternatively, you can fill out the login form that is already open. The first field allows you to select the type of TCF online banking account you want to sign in to. Personal Banking is selected by default. In the second field, you have to enter your User ID. Once you’ve filled out this information, click Next to proceed to the next step of the TCF Bank login procedure. On the next screen, enter your password. If you have two-step authentication activated, you may also have to enter a code you will receive on your phone. 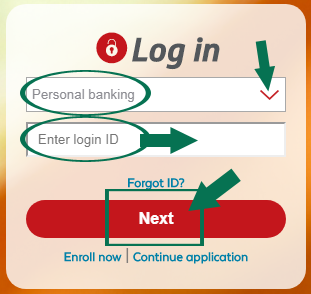 Click the button to complete the TCF Bank online banking login procedure. Open the TCF Bank website, www.tcfbank.com, to reach the TCF Bank online banking login menu. Type your username into the Login ID box. Click the red LOGIN button on the lower right. Locate the TCF Bank Mobile application in the App Store. Select Get and then Install to download the app. Launch the app by clicking Open in the App Store or selecting the TCF Bank icon. Tap the red Log In button. Provide your password when prompted to complete the login process. Locate the TCF Bank Mobile application on Google Play. Select Install to download the app. If you are having trouble with the TCF Bank online banking login procedure, the most common issue is that you have forgotten your login credentials. You will know exactly whether you have forgotten your User ID or your password, since you cannot proceed to the next step without filling them out in order. For each situation, there is a link below the TCF Bank login menu that will allow you to recover or reset the information you are having issues with. For other issues, we recommend you first take a look at the TCF Digital Banking Resource Center page on the TCF bank website. At the very bottom of the www.tcfbank.com website, you’ll see a row of buttons. These buttons will link to the TCF Bank customer service contact options. If you would like to call TCF Bank customer service for issues related to personal banking you can call 800-TCF-BANK or 800-823-2265. For other types of services, browse through the TCF Bank customer service page to find the number of the appropriate customer service department.We also recommend taking a look at the TCF Bank FAQ page for possible solutions and guidance. If you have a recent experience with the bank and would like to leave feedback, you can fill out the TCF Bank feedback form available on their website.